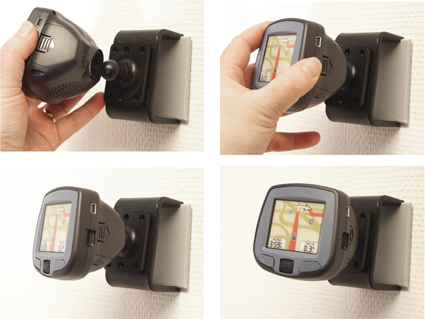 Keep your PNA GPS device in a holder attached to the dashboard, and you will always have it within easy reach! You can easily take the device with you when leaving the vehicle. The holder can be adjusted in order to avoid light reflection on the screen. 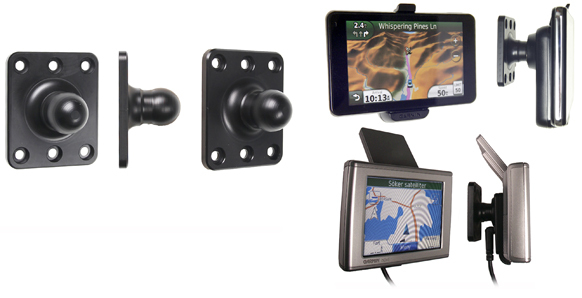 With this tilt swivel mount you can have your PNA installed on the dashboard. You use the original mount that comes with the PNA and press it onto the tilt swivel mount, which you can attach onto the ProClip Mounting Platform. This will give you a firm, neat installation. For Garmin 3597LMT in all countries. For Garmin Aera 500 in all countries. For Garmin Aera 510 in all countries. For Garmin Aera 550 in all countries. For Garmin Aera 560 in all countries. For Garmin Asus A10 in all countries. For Garmin Camper 780 in all countries. For Garmin dezl 560LMT in all countries. For Garmin dezl 560LT in all countries. For Garmin dezl 56LT in all countries. For Garmin dezl 570LMT in all countries. For Garmin dezl 570LMT-D in all countries. For Garmin dezl 760LMT in all countries. For Garmin Garmin Drive 40LM in all countries. For Garmin Garmin Drive 50LM in all countries. For Garmin Garmin Drive 60LMT in all countries. For Garmin Garmin DriveAssist 50LMT in all countries. For Garmin Garmin DriveAssist 50LMT-D in all countries. For Garmin Garmin DriveLuxe 50LMT in all countries. For Garmin Garmin DriveLuxe 50LMT-D in all countries. For Garmin Garmin DriveSmart 50LM in all countries. For Garmin Garmin DriveSmart 50LMT in all countries. For Garmin Garmin DriveSmart 50LMT-D in all countries. For Garmin Garmin DriveSmart 60LM in all countries. For Garmin Garmin DriveSmart 60LMT in all countries. For Garmin Garmin DriveSmart 60LMT-D in all countries. For Garmin Garmin DriveSmart 61LMT in all countries. For Garmin Garmin DriveSmart 61LMT-D in all countries. For Garmin Garmin DriveSmart 70LM in all countries. For Garmin Garmin DriveSmart 70LMT in all countries. For Garmin Garmin DriveSmart 70LMT-D in all countries. For Garmin Garmin DriveTrack 70LM in all countries. For Garmin Garmin fleet 590 in all countries. For Garmin nuLink! 1695 LIVE in all countries. For Garmin nuLink! 2340 LIVE in all countries. For Garmin nuLink! 2390 LIVE in all countries. For Garmin Nuvi 1100 in all countries. For Garmin Nuvi 1100LM in all countries. For Garmin Nuvi 1200 in all countries. For Garmin Nuvi 1260T in all countries. For Garmin Nuvi 1300 in all countries. For Garmin Nuvi 1300LM in all countries. For Garmin Nuvi 1300T in all countries. For Garmin Nuvi 1310T in all countries. For Garmin Nuvi 1340T in all countries. For Garmin Nuvi 1350 in all countries. For Garmin Nuvi 1350LMT in all countries. For Garmin Nuvi 1350T in all countries. For Garmin Nuvi 1370T in all countries. For Garmin Nuvi 1390LMT in all countries. For Garmin Nuvi 1390T in all countries. For Garmin Nuvi 1440 in all countries. For Garmin Nuvi 1450 in all countries. For Garmin Nuvi 1450LM in all countries. For Garmin Nuvi 1450LMT in all countries. For Garmin Nuvi 1450T in all countries. For Garmin Nuvi 1490LMT in all countries. For Garmin Nuvi 1490T in all countries. For Garmin Nuvi 1490TV in all countries. For Garmin Nuvi 1690 in all countries. For Garmin Nuvi 1695 in all countries. For Garmin Nuvi 200 in all countries. For Garmin Nuvi 200W in all countries. For Garmin Nuvi 205 in all countries. For Garmin Nuvi 205W in all countries. For Garmin Nuvi 2200 in all countries. For Garmin Nuvi 2240 in all countries. For Garmin Nuvi 2250 in all countries. For Garmin Nuvi 2250LT in all countries. For Garmin Nuvi 2300 in all countries. For Garmin Nuvi 2300LM in all countries. For Garmin Nuvi 2350 in all countries. For Garmin Nuvi 2350LMT in all countries. For Garmin Nuvi 2350LT in all countries. For Garmin Nuvi 2360LMT in all countries. For Garmin Nuvi 2360LT in all countries. For Garmin Nuvi 2370LT in all countries. For Garmin Nuvi 2440 in all countries. For Garmin Nuvi 2445 in all countries. For Garmin Nuvi 2445LM in all countries. For Garmin Nuvi 2445LMT in all countries. For Garmin Nuvi 2447LM in all countries. For Garmin Nuvi 2447LMT in all countries. For Garmin Nuvi 2450 in all countries. For Garmin Nuvi 2450LM in all countries. For Garmin Nuvi 2455 in all countries. For Garmin Nuvi 2455LM in all countries. For Garmin Nuvi 2455LMT in all countries. For Garmin Nuvi 2455LT in all countries. For Garmin Nuvi 2457LMT in all countries. For Garmin Nuvi 2460 in all countries. For Garmin Nuvi 2460LMT in all countries. For Garmin Nuvi 2460LT in all countries. For Garmin Nuvi 2467LM in all countries. For Garmin Nuvi 2475LT in all countries. For Garmin Nuvi 2495LMT in all countries. For Garmin Nuvi 2497LM in all countries. For Garmin Nuvi 2497LMT in all countries. For Garmin Nuvi 250 in all countries. For Garmin Nuvi 250W in all countries. For Garmin Nuvi 2539LMT in all countries. For Garmin Nuvi 2545 in all countries. For Garmin Nuvi 2545LM in all countries. For Garmin Nuvi 2545LMT in all countries. For Garmin Nuvi 2547LM in all countries. For Garmin Nuvi 2547LMT in all countries. For Garmin Nuvi 255 in all countries. For Garmin Nuvi 2555LM in all countries. For Garmin Nuvi 2555LMT in all countries. For Garmin Nuvi 2555LT in all countries. For Garmin Nuvi 2557LMT in all countries. For Garmin Nuvi 2558LMTHD in all countries. For Garmin Nuvi 2559LM in all countries. For Garmin Nuvi 2559LMT in all countries. For Garmin Nuvi 255W in all countries. For Garmin Nuvi 2567LM in all countries. For Garmin Nuvi 2569LMT-D in all countries. For Garmin Nuvi 2577LT in all countries. For Garmin Nuvi 2585TV in all countries. For Garmin Nuvi 2589LM in all countries. For Garmin Nuvi 2589LMT in all countries. For Garmin Nuvi 2595LMT in all countries. For Garmin Nuvi 2597LM in all countries. For Garmin Nuvi 2597LMT in all countries. For Garmin Nuvi 2598LMTHD in all countries. For Garmin Nuvi 2599LMT-D in all countries. For Garmin Nuvi 2599LMTHD in all countries. For Garmin Nuvi 260 in all countries. For Garmin Nuvi 260W in all countries. For Garmin Nuvi 265 in all countries. For Garmin Nuvi 2659LM in all countries. For Garmin Nuvi 265T in all countries. For Garmin Nuvi 265W in all countries. For Garmin Nuvi 265WT in all countries. For Garmin Nuvi 2689LMT in all countries. For Garmin Nuvi 2699LMT-D in all countries. For Garmin Nuvi 2699LMTHD in all countries. For Garmin Nuvi 270 in all countries. For Garmin Nuvi 275T in all countries. For Garmin Nuvi 2797LMT in all countries. For Garmin Nuvi 285W in all countries. For Garmin Nuvi 295W in all countries. For Garmin Nuvi 30 in all countries. For Garmin Nuvi 300 in all countries. For Garmin Nuvi 310 in all countries. For Garmin Nuvi 3450 in all countries. For Garmin Nuvi 3450LM in all countries. For Garmin Nuvi 3490LMT in all countries. For Garmin Nuvi 350 in all countries. For Garmin Nuvi 350LM in all countries. For Garmin Nuvi 3540LT in all countries. For Garmin Nuvi 3550LM in all countries. For Garmin Nuvi 3590LMT in all countries. For Garmin Nuvi 3597LMT in all countries. For Garmin Nuvi 3597LMTHD in all countries. For Garmin Nuvi 3598LMTD in all countries. For Garmin Nuvi 360 in all countries. For Garmin Nuvi 370 in all countries. For Garmin Nuvi 3750 in all countries. For Garmin Nuvi 3760LMT in all countries. For Garmin Nuvi 3760T in all countries. For Garmin Nuvi 3790LMT in all countries. For Garmin Nuvi 3790T in all countries. For Garmin Nuvi 390LM, Europe in all countries. For Garmin Nuvi 40 in all countries. For Garmin Nuvi 40LM in all countries. For Garmin Nuvi 42 in all countries. For Garmin Nuvi 42LM in all countries. For Garmin Nuvi 44 in all countries. For Garmin Nuvi 44LM in all countries. For Garmin Nuvi 465LMT in all countries. For Garmin Nuvi 465T in all countries. For Garmin Nuvi 50 in all countries. For Garmin Nuvi 500 in all countries. For Garmin Nuvi 5000 in all countries. For Garmin Nuvi 50LM in all countries. For Garmin Nuvi 52 in all countries. For Garmin Nuvi 52LM in all countries. For Garmin Nuvi 54 in all countries. For Garmin Nuvi 54LM in all countries. For Garmin Nuvi 55 in all countries. For Garmin Nuvi 550 in all countries. For Garmin Nuvi 55LM in all countries. For Garmin Nuvi 55LMT in all countries. For Garmin Nuvi 56 in all countries. For Garmin Nuvi 56LM in all countries. For Garmin Nuvi 600 in all countries. For Garmin Nuvi 610 in all countries. For Garmin Nuvi 650 in all countries. For Garmin Nuvi 660 in all countries. For Garmin Nuvi 670 in all countries. For Garmin Nuvi 680 in all countries. For Garmin Nuvi 710 in all countries. For Garmin Nuvi 750 in all countries. For Garmin Nuvi 755T in all countries. For Garmin Nuvi 760 in all countries. For Garmin Nuvi 765T in all countries. For Garmin Nuvi 770 in all countries. For Garmin Nuvi 775T in all countries. For Garmin Nuvi 780 in all countries. For Garmin Nuvi 785T in all countries. For Garmin Nuvi 850 in all countries. For Garmin Nuvi 855 in all countries. For Garmin Nuvi 860 in all countries. For Garmin Nuvi 880 in all countries. For Garmin Nuvi 885T in all countries. For Garmin SafeNav Powered by Garmin in all countries. For Garmin Street Pilot c510 in all countries. For Garmin Street Pilot c530 in all countries. For Garmin Street Pilot c550 in all countries. For Garmin Street Pilot c580 in all countries. For Garmin Street Pilot i2/i3/i5/2720 in all countries. For Garmin Zumo 340LM in all countries. For Garmin Zumo 350LM in all countries. For Garmin Zumo 390LM in all countries. For Garmin Zumo 590LM in all countries. For Garmin Zumo 660 in all countries. For Garmin Zumo 660LM in all countries. 1. Place the tilt swivel mount in the desired position. Screw the mount into place with the enclosed screws. 2. The tilt swivel mount is in place. This mount fits a number a devices, the installation procedure may vary but the principal is similar for all devices. 3. Installation of Nuvi etc: For the installation, you will use the original mount that comes with the PNA and press it onto the tilt swivel mount. Place the original mount by the tilt swivel mount so the tilt swivel fits. 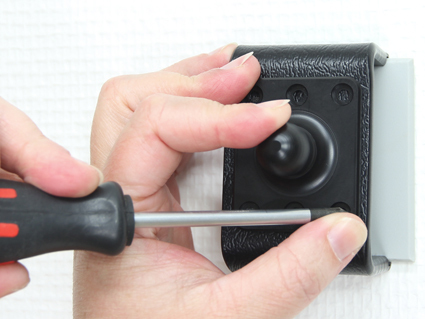 Press the original mount onto the tilt swivel mount, press until you feel it is properly in place. 4. Installation of Street Pilot etc: Place the device by the tilt swivel mount so the tilt swivel fits. 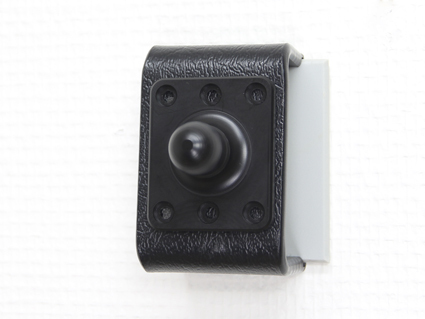 Press the device onto the tilt swivel mount, press until you feel it is properly in place.